Armchairs are naturals for slipcovering. If you’re covering an armchair that has a rounded back, consider a fabric that drapes well, such as slipcover-grade chenille or soft twill. A stiff or overly crisp fabric, such as toile, just doesn’t do a curvy armchair back justice. However, with a square-backed armchair, you won’t have any problem with the fabric draping, so you can use a fabric with more body, even Ultrasuede. From the back of your chair, measure up and over the seat back, across the cushion and front and down to the floor in front. This measurement is the length. For the width, measure the entire chair from left side to right, starting on the floor on one side and going over the seat down to the floor on the other side. Another alternative to 105-inch-wide fabric is using a queen-size flat sheet to cover the armchair and a twin-size flat bed sheet to cover the cushion. Combined, these sheets give you ample fabric. Choose good-quality sheets so the slipcover you make from them lasts. This project calls for a few yards of decorative trim. 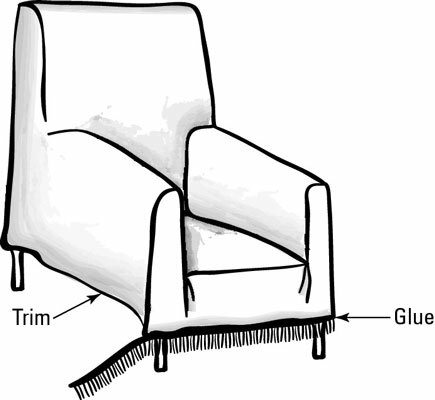 You must determine the amount of trim you need by measuring the fabric all the way around the bottom of the armchair after you’ve placed the fabric over the chair and secured and trimmed it. Iron all your fabric well, so that it drapes easily over the chair. Working from the top of the chair, place your fabric over the top so that it drapes evenly over the whole chair. Tuck the fabric into the crack at the base of the seat and on the insides of the arms. Make sure that the fabric drapes evenly. Replace the cushion over the draped fabric. You’ll be covering the cushion later; it’s just on top of the fabric to keep it in place. With the slipcover and cushion in place on the chair, carefully trim the fabric in front of both arms, so that it’s even with the fabric at the sides of the chair and in the back. Decide how much “leg” you want your chair to show. The fabric can also extend to the floor, if that’s the look you want. Drape the fabric evenly all around the chair’s base, and it needs to be about three inches from the floor if you plan to add trim and still show some leg. If you plan to hem the bottom and add no trim, leave an extra inch or so to create your bottom hem. Finish the bottom with trim or with a hem. With your hot glue gun, apply glue in dots on the backside of the trim. Press the trim on the fabric. Remove the fabric from the chair and spread it on your workspace. Sew a 1/2-inch hem all around, or use iron-on bonding tape, like Stitch Witchery, if you prefer. Remove the cushion to cover it. Place the cushion on the square of fabric you reserved for it and wrap your cushion as you would a gift. Use safety pins to secure the fabric directly to the underside of the cushion for a secure fit. Tuck both ends of fabric underneath the bottom of the cushion and use another safety pin to secure the flaps into place. Put the cushion back on the chair, and you’re done!